It’s the wind that gives the cold its bite, slicing through me despite my warm coat. As we huddle together in the wind, listening to the local guide talk about the site, I think about the people who lived here five thousand years ago. What must life have been like for them? We are on the Bay of Skaill on the west coast of Orkney Mainland, largest of the Orkney islands. The Atlantic Ocean laps up on the beach only a few yards away. The landscape is flat, tree-less, and very green. Here the site of Skara Brae, probably the best-preserved Neolithic village in all of Europe, provides a glimpse into how people in this bleak northern corner of Scotland lived in the prehistoric period. It’s an unusual-looking archaeological site, vaguely reminiscent of a honeycomb. That’s because the houses are half above ground and half underground, deliberately built into a midden – a pile of domestic refuse made of organic remains, discarded shells and bones, ashes, and animal dung that eventually develops a clay-like consistency. The chilling wind gives us a clue as to why they would use such an unusual building technique: it weather-proofed their houses and provided insulation against the cold and rain. We walk along a path that takes us around and through the site, and allows us a look down into the dwellings, seven one-room stone houses built of layers of flat sandstone. Connected by a covered passageway, one could have gone from house to house without venturing out in the weather. The roofs of the houses are missing, which suggests they were made of timber and turf, but much of buildings and furniture remains remarkably well-preserved. All the houses have the same basic plan: a low doorway leading into the chamber; on the walls to the left and the right of the door are stone box beds; on the wall opposite the door are stone shelves archaeologists call the “dresser;” in front of the dresser is a stone seat; a hearth at the center of the room would have provided heat and light. Most of what survives does so because it’s made of stone. We have to use our imagination to fill out the picture of life here ca. 2500 BC. The houses would have been dark and smoky, but also warm and snug. Animal skins piled on the beds and perhaps also draped around a canopy over them would have helped keep the inhabitants warm. Perhaps bracken or other plants were used to create soft mattresses. 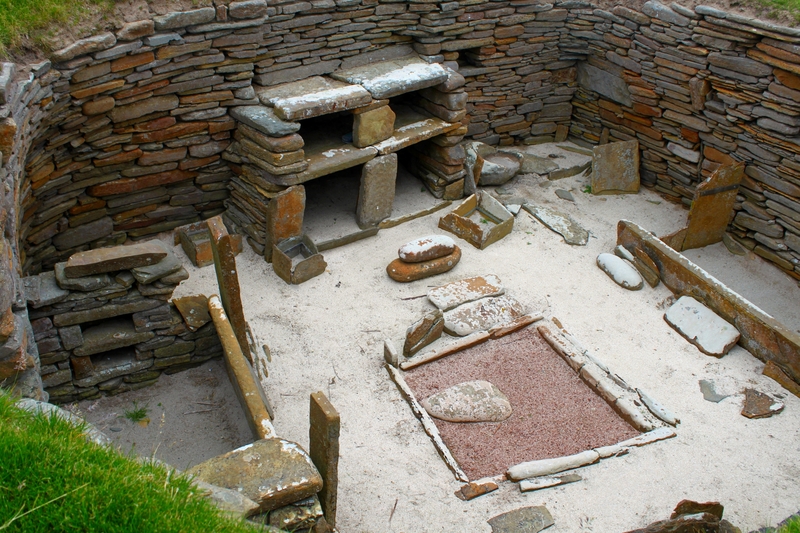 People first settled at Skara Brae about 3100 BC and lived here for some six hundred years. Archaeologists know that there are in fact two villages at on the site. The later village is the one we see. At least two houses of the earlier period remain, but more of the earlier village can’t be excavated without digging through the later houses. After the site was abandoned, it was gradually buried in sand. But a massive storm in the mid-nineteenth century uncovered the ruins and excited the interest of the local landowner. Since then excavations of the site have provide us with a glimpse into the lifestyles of people who lived and died thousands of years ago. Miriam C. Davis has an M.A. in medieval archaeology and a Ph.D. in medieval history. She is a professor of history at Delta State University, where she teaches European history and the history of Christianity, and has participated in archaeological excavations in Mississippi, Alabama, England, and Scotland. In addition to her scholarly publications, Miriam has written for the popular press on archaeology, history, and travel. She has lectured throughout the U.S., Great Britain, and Israel.